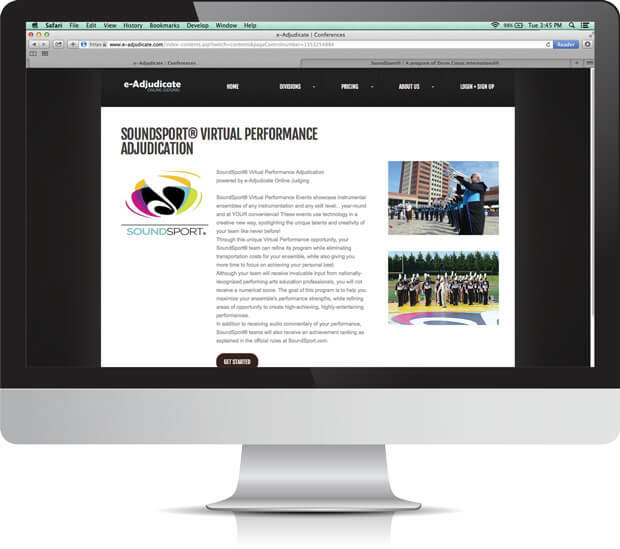 Drum Corps International is pleased to announce the launch of SoundSport® Virtual Performance Events, powered by e-Adjudicate Online Judging. Utilizing technology in a creative new way, SoundSport teams will be able to spotlight their unique talents and creativity like never before. Through an online portal, participants will receive invaluable input from nationally-recognized performing arts education professionals and feedback to help them maximize their ensemble's performance strengths, while refining areas of opportunity to create high-achieving, highly-entertaining performances. As part of the virtual adjudication process, teams will receive audio commentary on their performance in addition to receiving an official SoundSport achievement ranking. "Creation of a virtual performance option has been one of our goals since we first conceptualized SoundSport" said John DeNovi, director of business development for Drum Corps International. "These Virtual Performance Events give our growing number of international teams, as well as U.S. teams, the opportunity to have their efforts judged and rewarded even if they are unable to attend a live event." Through this unique virtual opportunity, SoundSport teams can work to refine their programs while eliminating transportation costs for ensembles, while also giving them more time to focus on achieving their personal best. "e-Adjudicate is proud to be joining the already exciting world of SoundSport as we reach out domestically and internationally to offer the first of its kind Virtual Performance Adjudication," said Peggy Bilbruck, owner of e-Adjudicate. "Together we can make the SoundSport experience happen in your hometown or anywhere in the world." SoundSport groups who want to be critiqued throughout the season, or who are only able to go to one competition, will now have a chance to gain invaluable insight into making their show the best it can be. We're excited about SoundSport Virtual Performance Events as it'll allow our members to gain knowledge and experience from judges all through the season. SoundSport Virtual Performance Events will provide us with the tremendous opportunity to be evaluated by DCI judges who will help us improve based on their professional and educational suggestions and assessments. This system will also help us to communicate and share our experiences with the world. SoundSport is the ultimate tool for developing modern marching music in China! My band in China—as well as many others—is so excited about being a part of SoundSport and knowing we can compete and be evaluated without having to break our budget for international travel. Virtual judging is a wonderful idea! In addition, being part of the SoundSport and DCI brand is so valuable for my students' education and growth. They are not only learning about other students and other cultures, but they are learning more about themselves and how to be better people. Ultimately though, my students like SoundSport a lot because it is fun! SoundSport Virtual Performance Events will give our corps the perfect opportunity to have DCI judges offer constructive feedback on our show as we prepare to tour the United States next summer. We plan to use the comments to make the appropriate changes so we can maximize our performance at the live SoundSport event in Indianapolis. At the same time, SoundSport Virtual Performance Events give our members something to work hard toward. We're shooting for a gold medal rating. To learn more about SoundSport and performance opportunities both live and virtual, contact SoundSport Events and Promotions Manager Eric Hjellming at soundsport@dci.org.